A few months ago I discovered Buffer for Twitter scheduling, and I find it a fast and efficient way to schedule not only tweets, but Facebook status updates as well. A free Buffer account allows you to schedule as many as 10 updates a day, at customized intervals that you customizein your settings. It also has an automatic link shortener, a bookmarklet feature for your toolbar so you can easily add to your lineup, and even some suggested quotes if you find yourself a little short on ideas. While Hootsuite and Tweetdeck are also good for scheduling, I like the simplicity of Buffer more for this purpose. You aren't distracted by your Twitter stream while trying to schedule your tweets, and I like the flexibility if being able able to change the frequency and pattern of your updates. You can also choose between bit.ly and j.mp for your preferred URL shorteners, and there is a cool referral feature where if someone were to start their new Buffer account using this link (this is my referral link if you want to send an extra post my way), they get a free extra post beyond the 10 included. 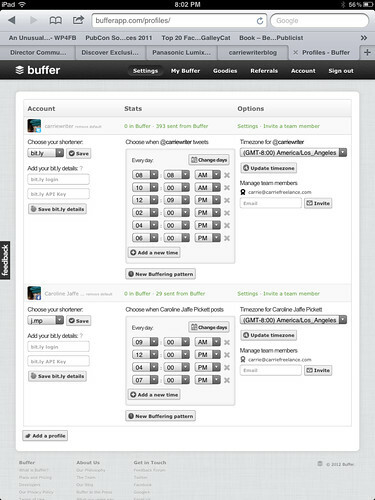 Below is a screenshot of the Buffer settings page, which enables users to select either a random buffering pattern, or specific times of the day for updates. Animoto (affiliate) is probably one of the most important and dynamic tools I've discovered over the last 3 years. This cool photo to video program enables users to drag and drop photos into a screen, add text if needed, select music, and select spotlight features for images you want to highlight. A video is then created while you wait, and a completed video can be remixed again and again. You can instantly upload to Facebook, YouTube, or just keep the video file on your desktop to have handy when you need it. I have found it super useful for client work, as I can edit or switch out images as needed and the movie remixes without having to begin all over again. A free account includes 12 images, while a premium account is $30 a year and offers unlimited images and the option of HD quality. One of the challenges of creating original videos is finding good quality, royalty- free music, and I love how Animoto lets you select and preview from a wide variety of genres, including pop, folk, electronic, classical, jazz, and others. Users need to be mindful that when adding video clips to your lineup, there is a 10-second limit, so you will have to edit clips that exceed that length. Also, there is limited space for text --a title and tagline are about all you'll have room for. Animoto also offers a great selection of images and video clips you can use to embellish your videos. I previously wrote about Animoto here almost exactly a year ago, if you want to review the features more closely. Recent new features include an iPhone app, and a more streamlined image upload process. For those interested in creating dynamic event highlights or previews, Animoto works great and is a lot more fun then your typical slideshow. For example, in my highlights for 2010 video, I really had fun creating the sequences, and even found a butterfly template that matched my logo. Twittelator is one of my favorite iPad apps...it's super fast, and only $4.99. The app allows for easy updates to your Twitter account, with an optional toggle that enables your Facebook account as well. New mentions and direct messages are highlighted in a pop-up so you always see the latest activity, and Twitter List and Search features are also included. It's easy to access your photostream and image library to add graphics to your tweet, and if you need to take a new photo you can click right onto your camera. As of now there is no scheduling feature, but of course this would be great to have. 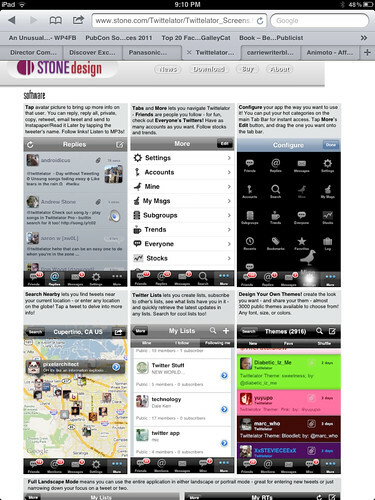 Stone Design, the folks behind Twittelator, not only invested a great amount of time in thinking through the user experience, they also focused a lot on little details. My favorite is the “slide to send” button, which works exactly like the “slide to unlock” control we all know from our iPhone/iPad lock screens. Prevents you from accidentally sending your tweet away by tapping “send” which, on a touch device, happens way more often than not. Last but not least, there is “automatic state saving” everywhere. As on the iPhone, applications on the iPad cannot run in the background. This means whenever you press the home button, Twittelator gets shut down immediately. Now, the next time you launch it, it magically fires up at the exact point where you left it before, whether you were in the middle of typing a tweet or browsing through your direct messages. Love it! Call me silly, but I'm also a fan of the fun emoticons you can add to the end of your tweets. That wraps up "8 Days Social Media Tools & Tips." Have you tried Twittelator, Buffer, or Animoto?